Sam Huggard chairs a panel of union leaders - Dale Lee, Sandra Grey, Muriel Tunoho - to challenge us to continue to shift on our collective impact journey by exploring, and learning, from the experiences of other unions. 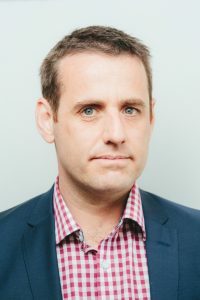 Sam Huggard was elected Secretary of the New Zealand Council of Trade Unions Te Kauae Kaimahi in 2014. He brought to the role 15 years of involvement in campaigns and advocacy work across trade unions, the community sector and students’ associations, most recently at FIRST Union (2009-2014) and as National Convenor of Campaign for MMP in 2010-2011. 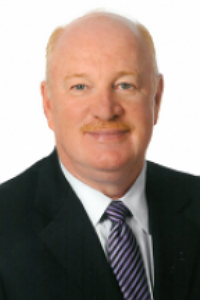 He also lectured part-time for six years on Unitec’s Graduate Diploma in Not-For-Profit Management. Sam’s role at the NZCTU weaves together and drives many of the strands of NZCTU priority areas such as union growth, equal pay, just transition and the current campaign to strengthen Kiwi’s work rights. 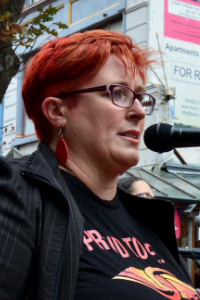 Sandra Grey is currently the National President of the New Zealand Tertiary Education Union, a role she has held for nearly six years. Sandra is an academic from Victoria University of Wellington. Her research and teaching focuses on citizen engagement in policy development and public debate. Sandra’s activism has included being the spokesperson for the Campaign for MMP from 2008-2012 and she is currently on the board of the Living Wage Movement Aotearoa. When we invest in the students of West Virginia, that’s when we know we can reach huge dividends along the lines. It all has to revolve around making sure we have the best and the brightest in our classrooms, that those positions are filled with certified educators and that we provide not only a good compensation for them, but a good compensation plan. Dale Lee is the president of the West Virginia Education Association, part of the National Education Association in the United States. Through his presidency of the state union, he has successfully won salary increases for all school employees in his state, thus beginning to move teacher salaries to the national average. This victorious nine-day work stoppage in early 2018 sparked the Red for Ed movement across the United States to advocate for public education employees and quality public education. Lee’s work ensures public education funding remain a priority for elected leaders at both the West Virginia state and local level. Through his leadership, he has influenced the increase the level of respect shown to education employees and the tremendous work they do. Dale is in his fourth three-year term as President; his current term expires in 2020. The West Virginia Education Association is the state’s largest public employee organization with 11,000 members; it represents teachers, service professionals, administrators, and higher education employees. Prior to being elected as President of the West Virginia Education Association (WVEA), Lee served for three years as Vice President, five years as Treasurer and three years as a member of the Executive Committee. He has also been an active leader and member in his local, the Mercer County Education Association, since he began teaching in 1986. Lee is a graduate of Clinch Valley College (in the state of Virginia); he has a special education certification through the West Virginia College of Graduate Studies. A veteran teacher of 22 years, his assignment was teaching special education and coaching several sports at Princeton Senior High School. He is currently on a leave of absence during his service as WVEA President. The education union movement is an important part of Dale Lee’s family. His daughter, Danielle, is a middle school teacher in West Virginia and became the third generation to strike for public education in West Virginia (Dale’s dad, David, walked out in 1979, Dale in 1990 and Danielle in 2018). His youngest daughter, Jessica is a paraoptometric and her husband Zach is a high school guidance counselor in West Virginia. Muriel has an extensive background in governance and working experience in primary health, community development, union and political campaigning. She was an active leader in the formation of E tū union with a personal drive to build a bigger, modern, and outward-looking private sector union, fit for her mokopuna and future workers. She has been President for E tū since 2015 and is a proud rank and file member and union leader. 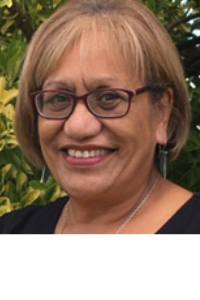 As a life member of E tū and foundation member on the Living Wage Movement Aotearoa Board, she shares a collective commitment to lift low pay and strive for a fairer and civil society in Aotearoa. The Living Wage Movement works intentionally with unions, community and faith groups to build power in our communities and to transform worker’s lives. She served as a Board of Trustee Chairperson when her 2 sons were at primary school. Now her adult sons work in political campaigning and social justice and she enjoys three lively mokopuna at Avalon Primary School, Avalon Intermediate and Te Ara Whanui Kura Kaupapa Maori. E kore au e ngaro. He kakano i ruia mai i Rangiatea.